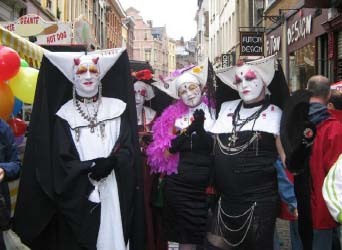 Gay Pride Bruxelles, 2006: Fatwa of love. 10 of us gathered in the center of Brussels around 1:30 pm for a gay and happy afternoon,“You’ll be able to see it with the pictures added to this summary”, although it was a little cool, in order to distribute our wonderful cards. Coming from the north the three Cht’is (as they call themselves), Francis, Pierre and Regis, in a Belgian corner. DD, Regnier Chris and I, Marie-Madeleine, came a little later, and Nathaniel and his friend. We were a little group, but we nevertheless able, thanks to the tool of the day, to get a certain number of contacts, because out of the 3300 Fatwa of Love cards that we had available, we were able to “place” between 1300 and 1400, and only a few of them ended up on the street after having been read. In order to do that, we split into 2 groups and walked for a while beside the floats, where we could distribute many cards to the curious people who came to admire the procession. Some floats were very amusing, even very sensual, with very attractive young men and women on them doing some sensual scenes and dances. explanation came: “yes, change the world, by replacing hatred for love, by answering to hatred by love”. more? We are part of a group of 25 guys and we’d like to give one to each one of them, maybe more if you agree” I don’t have to tell you how much I agreed with them, of course, but what pleased me the most is to tell you what one of them said as they left: “It’s a good thing that you are here!” What a wonderful reward it was! Later on, the group ended up in the gay village. The ambiance in the village was warm, as we cold even feel love that emanated from the people around there. We continued our distribution. Many people had heard about the Ayatollah al-sistani and his Fawta against homosexuals and found our action remarkable. Entire groups asked for our cards, sometimes 10 or 20 at a time. A man who had received the card from Marie-Madeleine was wiggling in the crowd and he tenderly kissed us all when we passed in front of him, his eyes shining with happiness. It was so good… like a bath of love. It is amusing and pleasant to see the welcome that we get every year in the gay community during the Gay Pride day, while the associations that are supposed to defenc the rights of the sexual minorities in Belgium refuses us the right to participate in the parade with a float, every year. Perhaps they are afraid of the success we might have! After our happy diffusion, we went to get one last drink in a café nearby, before leaving at about 6:30pm, satisfied with our sensual and happy afternoon. We shared the rest of the cards between the north and Belgium so that the actions can continue in regions in the coming weeks. All those who couldn’t participate in this fabulous day will be able to join us more actions to take place in the weeks to come.